Bottle of 5 L water. Enjoy delicious and refreshing water in your office. 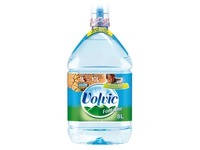 With Cristaline 5L can you provide a lot of people in your office with fresh water. You can get different sizes at JM Bruneau. In this way, it is possible to answer the different needs of your staff. Cristaline 5L is pure mineral water and very healthy for body and soul. Water raises the concentration and helps you to work more efficiently.